Planning a wedding is a piece of delicious cake! Take these cupcakes from Mark Joseph Cakes for a wedding inspired by none other than Tiffany & Co.
What makes this design work so well? Thematic elements need not be overtly apparent. 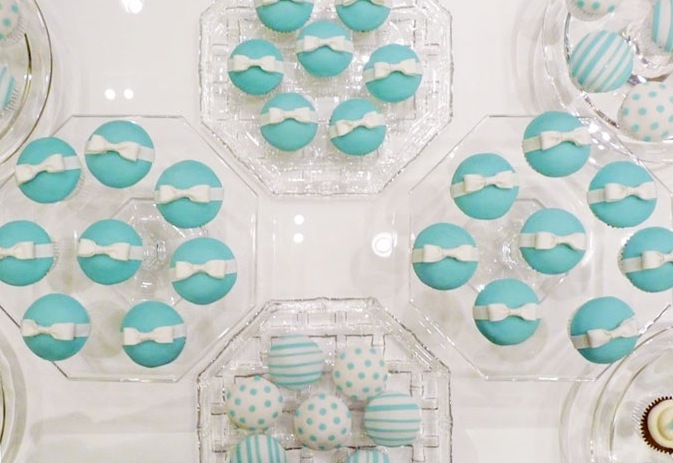 Here we get get the distinctive Tiffany colors and bow; by incorporating a mix of design elements such as polka dots and stripes make these cupcakes more than just your average Tiffany & Co inspired wedding. Presenting these treats using several geometric shaped plates instead of the traditional cupcake tower gives the overall presentation a modern, sophisticated flair. Take note of the main components of your inspiration and incorporate them with a gentle hand. Image via Mark Joseph Cakes. Tiffany Blue and white is such a gorgeous, classic, and romantic colour combination for a wedding. J'adore! i have a sweet tooth now... darn u Grace !